November 7 2015. 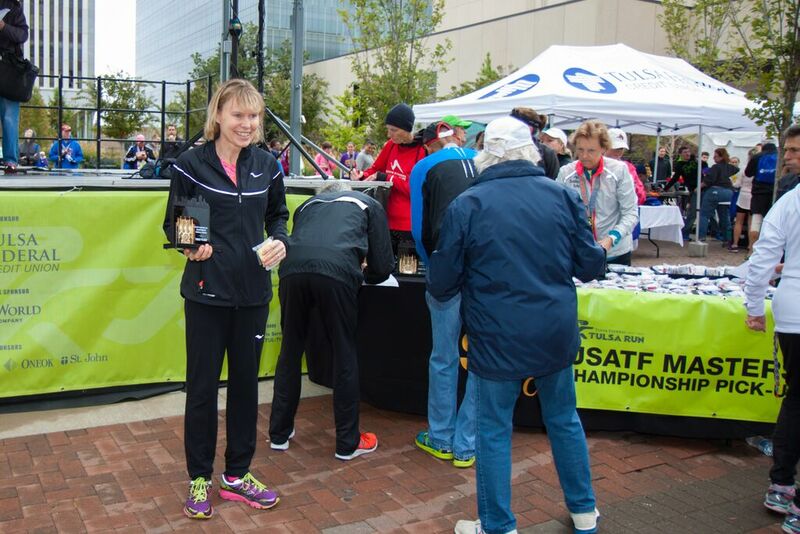 The Federal Credit Union Tulsa Run hosted their 3rd USATF 15K Masters Championships on the 31st of October. Batman was taking the photos and there were lots of witches and zombies in the Open Race. 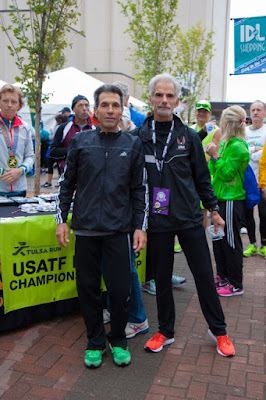 But the USATF Masters runners had their running kit and their game faces on. They were focused on the competition and the challenging race course, gaining renown for its many hills. Before 2014 the course was aptly described as flat and fast. Then Tulsa decided to redevelop its riverside and the course was rerouted. There is now a very steep, long climb at the 1.5K mark and then another slightly shorter one at 7K. Finally you encounter the steepest hill at 13K, luckily not as long as the earlier ones. But the weather was nearly ideal. Rainy the day before, it ended around dawn and the skies were overcast with mid 50 degree temps and a slight wind. 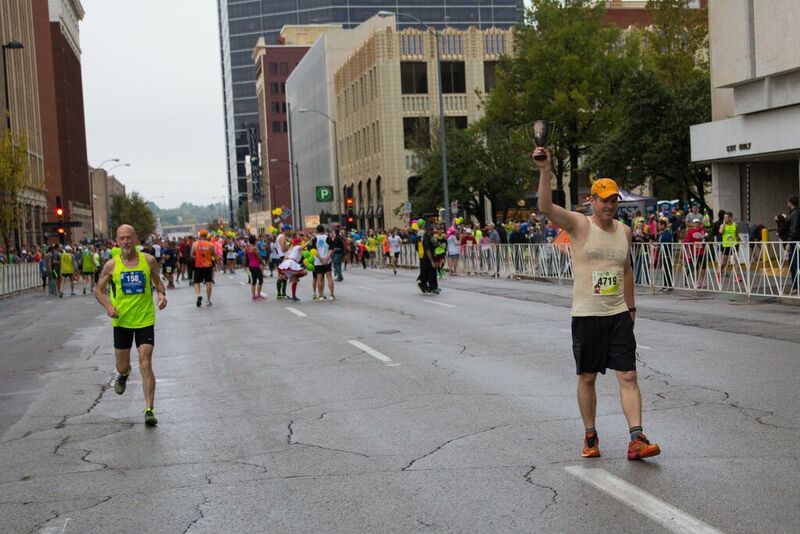 The runners found that the wind intensified during the race however and blew pretty strongly into runners as they approached the bridge back over the Arkansas River 12K into the race. Unless you had saved something, that stretch was pretty tough. Men.Timothy Martin (New Salem IN) is new to USATF championships but did not let that phase him as he pulled away from the field up the first big hill. 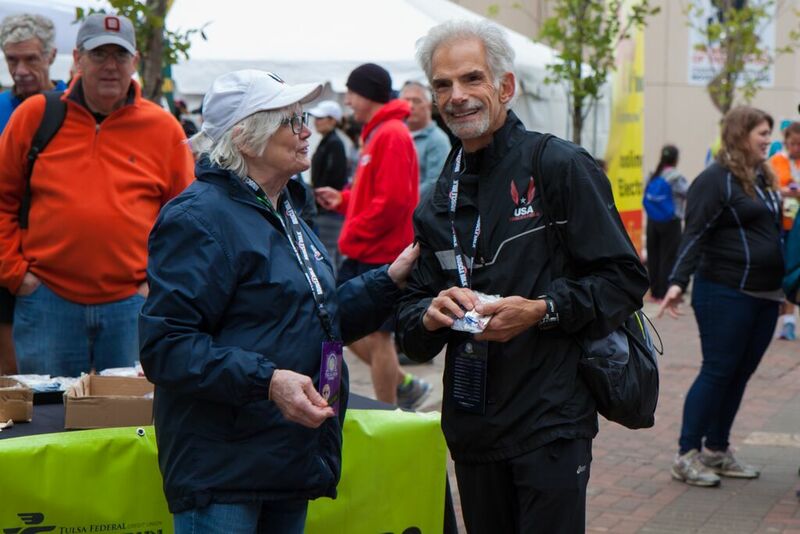 Martin was an unknown quantity; this was his first USATF Masters Championship and he entered at the Expo just the day before. The top runners from the Cal Coast Track Club, John Gardiner (Rancho Santa Margarita CA)and Christian ‘Cush’ Cushing-Murray (Santa Ana CA) were in hot pursuit, wondering if this unknown guy was the real deal or not. 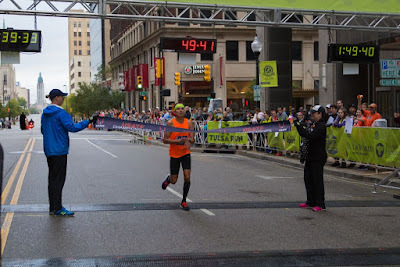 Martin was definitely for real, building his lead steadily from 30 seconds at 5K to almost a minute at 10K and cruised in with a 70 second win, on a very tough course in 49:43. 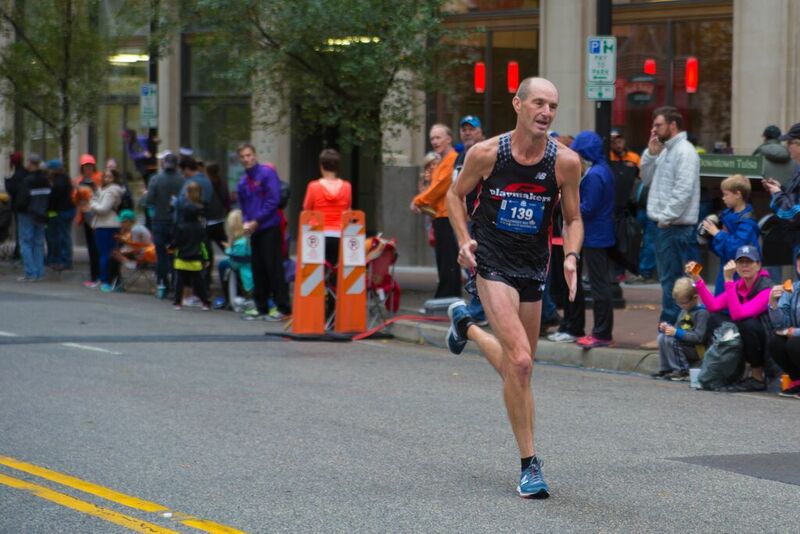 John Gardiner, a seasoned USATF veteran and frequent podium finisher, took 2nd in 50:53. His teammate, ‘Cush’, hung with Gardiner as long as he could, with both hitting 5K at 16:46. Gardiner gradually pulled away over the next 5K but Cush hung strong and took 3rd in 51:31, denying the talented Sooner runner, Jason Butler, (Oklahoma City OK) a podium finish. In my preview, of the runners who actually made the trip to Tulsa, I had Gardiner, Butler, and Cushing-Murray in that order. 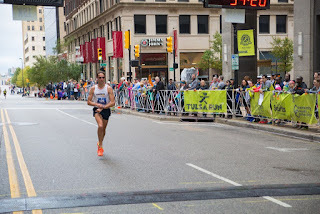 But noted that Butler might have heavy legs from the USATF Marathon Championship 4 weeks earlier. 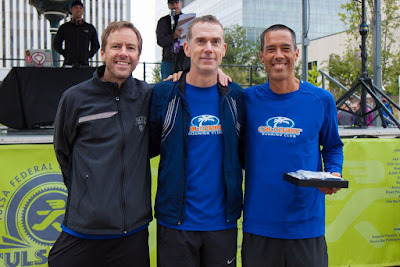 Although Martin is relatively unknown in Masters circle there was some speculation that he may be one of the Martin twins, Theo and Tim Martin, who dominated Arizona High school running in the early 1990's. Women. 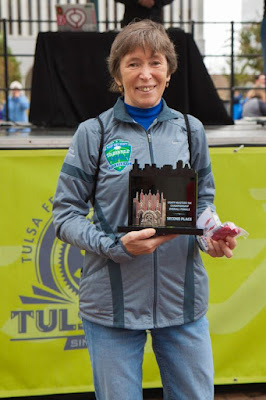 Deborah Torneden (Manhattan KS) took 1st place on the women’s side. This is the 3rd time this year a woman from the 50-54 group has been the overall winner at a USATF Masters Championship Road Race. 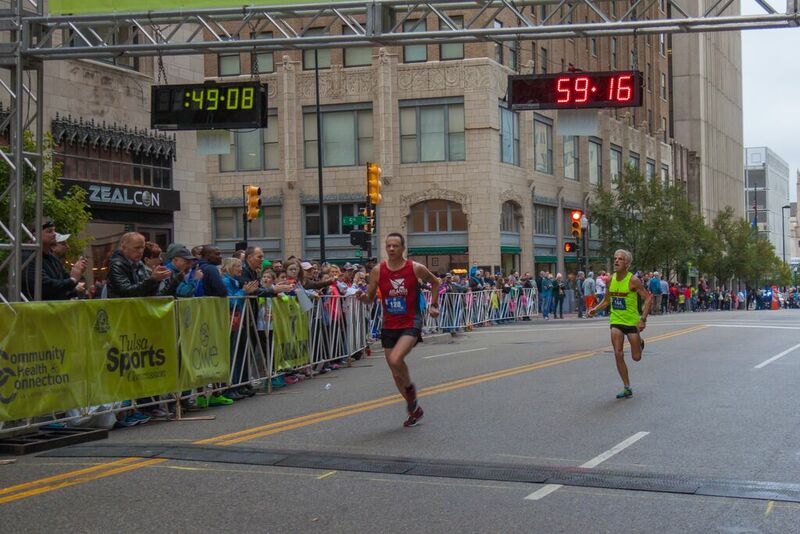 Torneden improved on her 2014 3rd place time in this race by nearly 5 minutes to win handily in 1:01:34. 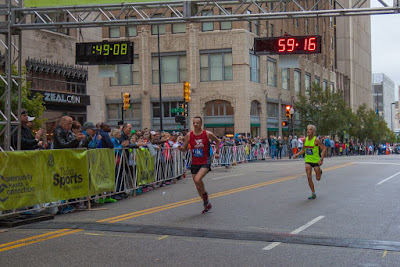 Elena Shemyakina (Geneva IL) and Janice Rempe (Roswell GA) finished in 2nd and 3rd respectively in 1:04:26 and 1:04:43. Rempe hung tough with Torneden for the first 5K, as they passed the 5K mark in 20:30 and 20:32. But Rempe paid the price as Shemyakina closed to within a second at the 10K mark and moved past shortly after to build the 17 second gap. Age Grade Championship. Few thought anyone would crack the 90% age grading barrier, much less 95. But that is exactly what Sabra Harvey (Houston TX), 66, did. Harvey finally recovered from a freak ankle injury that kept her out of competition and limited her training in the first half of the year. Harvey scored a 96.06% and was the only runner to break the 90% barrier. Honor Fetherston (Los gatos CA), 60, cruised in with an 87.72%. There was no one as dominant as Harvey on the men’s side but the age-grading was much closer. In fact 1st and 2nd was decided by a few hundredths of a percent. 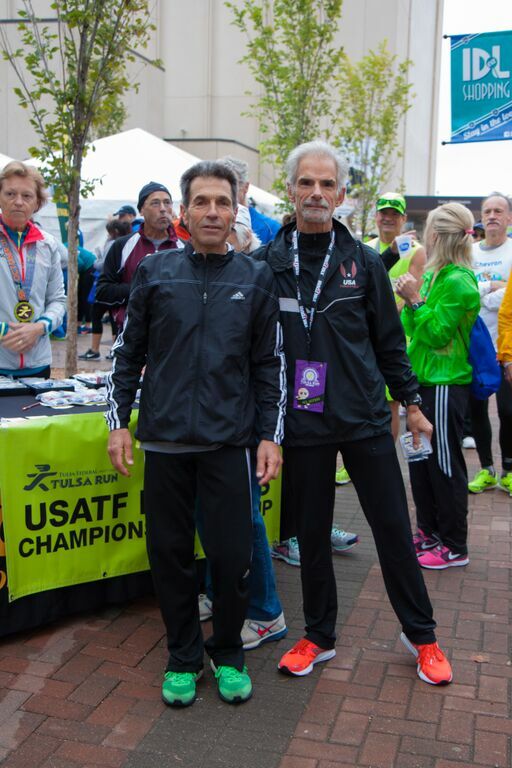 Tom Bernhard (Castro Valley CA), 64, claimed his 2nd straight USATF age grade championship on the roads with 87.77%. Nat Larson (Amherst MA), 53, took 2nd with 87.74 and Cushing-Murray, 48, took 3rd with 87.45. Unlike Harvey, Bernhard ran a negative split for the first two-thirds of the race, hitting the 5K mark in 19:30 and covering the 2nd 5K in 18:40. When he hit the headwind at 12K, Bernhard had to draw on his strength to close out with a last 20:09 5K. Age Grade Elite Performance Medals. In addition to the top age-grading performers described above, the individuals listed below were awarded Elite Performance Medals for age grading at or above 80% on this very challenging course. They are listed from high to low score. Because there are no course difficulty adjustments, it was not easy to earn the medal. These individuals ran great races on a challenging course--Well done! Women. Elena Shemyakina, Andriette Wickstrom, Mary Sweeney, Janice Rempe. Men. Lloyd Hansen, Timothy Martin, Rob Arsenault, John Gardiner, Matt Ebiner, John Victoria, Dave Bussard, Francis Burdett, Ron Zywicki, Craig Gunby, William Moore, Jason Butler, Antonio Arreola, Mark Rybinski, Ruben Henderson, Robert Garcia, Devin Croft, Peter Mullin, Bruce Kirschner. M40. 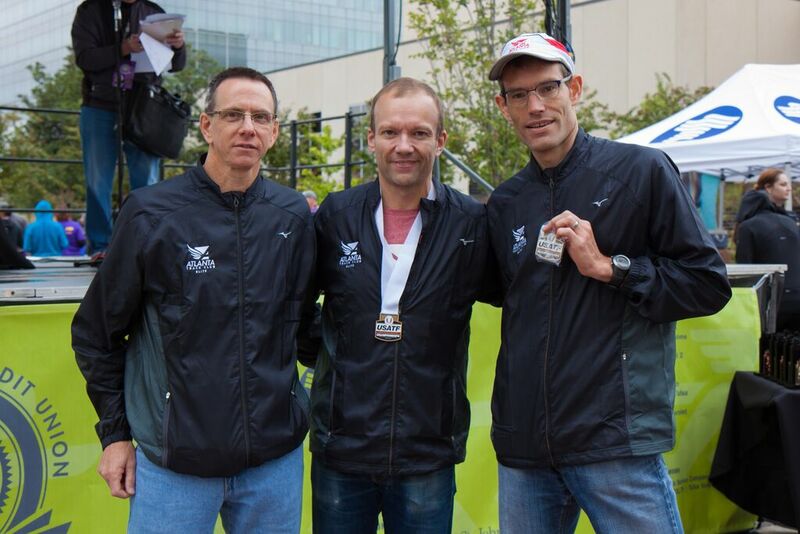 Tim Martin, 1st in 49:43, and John Gardiner, 2nd in 50:53, were joined on the podium by Jason Butler. His 51:58 ensured Butler his third consecutive top-3 M40 finish at this race. Butler was only 6 seconds back of Gardiner at the 5K but Gardiner pulled away steadily after that. 1-Martin, 2-Gardiner, 3-Butler. M45. Cushing-Murray, 1st in 51:31 was joined on the podium by his teammate, Rob Arsenault (Riverside CA), who took 2nd in 53:20 with Matthew Whitis (Columbus GA) 3rd in 59:18. Cushing-Murray's 5K splits were 16:46, 17:34, and 17:21. 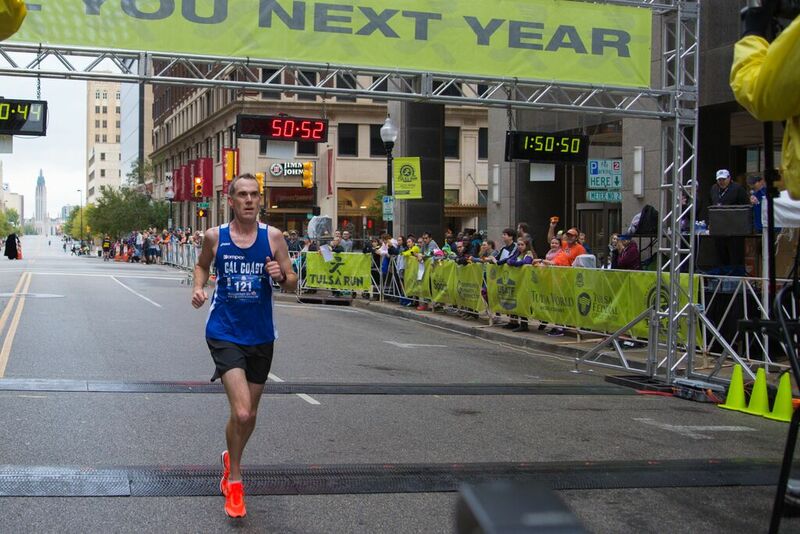 Once again, Cushing-Murray demonstrated his staying power, adding this to his impressive performance at the USATF Half Marathon Championships in late May in San Diego. He walked away with two first places (M45 and M40+ Team) and two thirds (overall and age-grade)--Quite a haul! 1-Cushing-Murray, 2-Arsenault, 3-Whitis. M50. 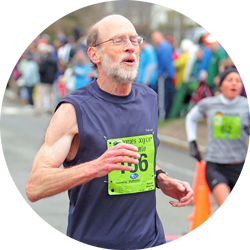 Nat Larson, who finished 2nd in age grading, ran 1-2 with his Greater Springfield Harrier teammate, Francis Burdett (Worcester MA), for the first 10K, both hitting the 5K in 17:29 and the 10K in 35:19. Larson pulled away in the last 5K to win in 53:36 with Burdett 2nd in 54:12. Matt Ebiner (Covina CA) claimed 3rd in 55:28. 1-Larson, 2-Burdett, 3-Ebiner. M55. 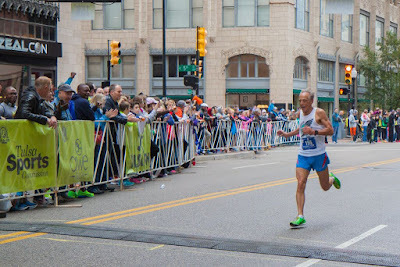 This group was Dave Bussard’s (Elkhart IN) all the way, with a 20 second lead at the 5K which he built up through the race to win by a minute and a half in 56:34. His 5K splits were 18:32, 18:34, and 19:28. Antonio Arreola (San Jose CA) also ran strong, stringing together 18:53, 19:14 and 20:02 5K splits for 58:09. Gary Radford (Cicero NY) finished 3rd in 1:03:43. 1-Bussard, 2-Arreola, 3-Radford. M60. With Tom Bernhard claiming the age grading crown, one might think he ran away with this age group. In fact, John Victoria (Colorado Springs CO), the terrific runner for the Boulder Road Runners came with the idea of sticking to Bernhard for as long as he could. At the 5K Championships in Syracuse, Bernhard had beaten Victoria by 27 seconds. Victoria was determined to make it closer. They hit the 5K mark at 19:30 and 19:33; the 10K mark at 39:10 and 39:13. Gradually, however, Bernhard pulled away over the last 5K to claim the win, 59:19 to 59:44. Quite a battle! Mark Rybinski (Manlius NY) was just off their pace, finishing 3rd in 1:00:42. 1-Bernhard, 2-Victoria, 3-Rybinski. M65. Lloyd Hansen (Salt Lake City UT), the M65 Runner of the Year, did run away and hide in this one, finishing 1st in 1:01:51. His 5K splits were 20:31, 20:27, and 20:53. Jerry Learned (Gainesville GA), originally from northern Vermont finished 2nd in 1:10:25 to keep himself well up in the race for top 3 in the M65 Individual Grand Prix. 1-Hansen, 2-Learned. M70. This category had, arguably, the most competitive race of the day, with 4 lead changes. Przemyslaw Nowicki (Holmdel NJ) took off when the gun sounded but Paul Carlin (Indianapolis IN) caught and passed him at the 2K mark as they both charged up the first steep hill. By the 5K mark, Carlin had built a 15 second lead, hitting it in 23:01. But Nowicki battled back and passed Carlin just after the 4 mile mark. Now it was Nowicki's turn to pull far away as they toiled up the 2nd big hill. By the 10K mark, Nowicki had nearly 30 seconds on Carlin hitting it in 46:42. It seemed too much of a lead to hope that Carlin could close the gap. But that is what happened. perhaps helped by the headwind, Carlin finally caught and charged past Nowicki with about 500 meters to go. Was Nowicki spent or had he saved something? Nowicki has shown in the last few weeks that he is a real battler and here again he dug deep, found another gear and stormed past Carlin with about 200 meters to go and that was it. Carlin had no more answers. Nowicki prevailed, crossing the finish line in 1:10:54, a mere 4 seconds ahead of Carlin who finished 2nd in 1:10:58. M75. 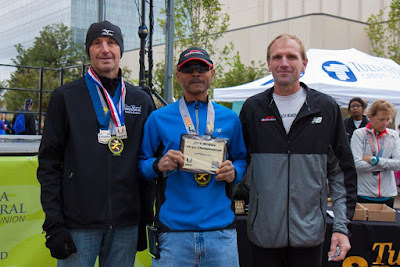 It is a tribute to the competitiveness of USATF Masters LDR from the 40's to the 70's that the two oldest age groups contributed the two closest races of the day. Roland Cormier (Jackson NJ) strode out smartly, with Fay Bradley marking his time. Cormier hit the 5K in 28:53 with just over a minute's lead. Thereafter Bradley started chipping away. By the 10K mark, Cormier's lead was down to 5 seconds, 56:13 to 56:18. Bradley continued to chip away until they were even. 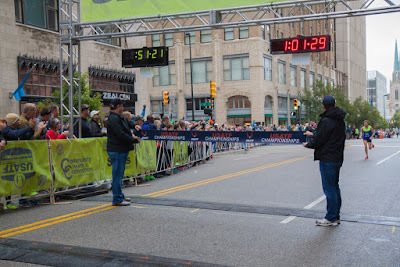 In the end, Bradley had just a little more left than Cormier as Bradley took the M75 crown by 7 seconds in 1:23:11--Wow! 1-Bradley, 2-Cormier. W40. Heather Meehan (Tulsa OK) won this group with a time of 1:17:10. W45. Stacy Shaw (Elkhorn NE) placed first in 1:09:34. Melauna Wescott (Yukon OK) was 2nd in 1:53:10. 1-Shaw, 2-Wescott. W50. Deborah Torneden took 1st in 1:01:34, with Janice Rempe, 2nd in 1:04:43, and Julie Donelson (Tulsa OK) 3rd in 1:06:42. 1-Torneden, 2-Rempe, 3-Donelson. W55. 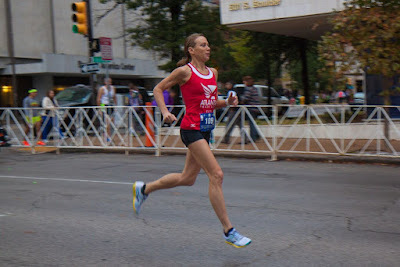 Elena Shemyakina won in 1:04:26; Mary Sweeney (Atlanta GA) ran a strong 2nd in 1:05:47. Shemyakina's 5K splits were 20:53, 21:13, and 22:20. 1-Shemyakina, 2- Sweeney. W60. Honor Fetherston and Andriette Wickstrom (Storm Lake IA) ran a terrific, competitive race, the tightest on the women's side. Wickstrom hit 5K in 21:47 with Fetherston over half a minute back. By the 10K Fetherston had closed to within 21 seconds in 44:59. From there Fetherston was able to pass and hold the lead to win in 1:07:36 to Wickstrom’s 1:08:07. 1-Fetherston, 2- Wickstrom. W65. Sabra Harvey ran solo and won the race in 1:07:12. As Don Lein put it at the Awards Ceremony, Harvey is a nonpareil anyway. Perhaps it is fitting that as she has no peers, she had no challengers. W70. Judy Bomer (Tulsa OK) placed 1st in this group in 1:30:03. Women. 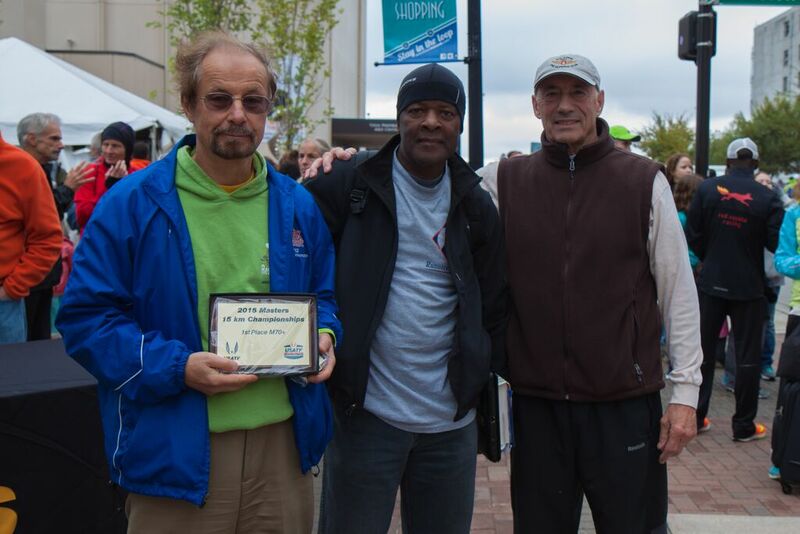 50+: The Atlanta Track Club took the Women’s 50+ division, unopposed, with a 3:22:52 cumulative time). Janice Rempe led the way but had able support from Mary Sweeney and Barbara Chandler (Newnan GA). Men. 40+: The Cal Coast Track Club (Southern Cal) took the 40+ division hands down. With John Gardiner and Christian Cushing-Murray coming in under 52 minutes, their two teammates, Rob Arsenault and Matt Ebiner would have had to lose their way on the course. Naturally that did not happen and Cal Coast won by nearly 15 minutes.There was a real battle for 2nd however. Jason Butler led the way for the OK Runner Elite team and the Atlanta Track Club tried to counter with superior depth. 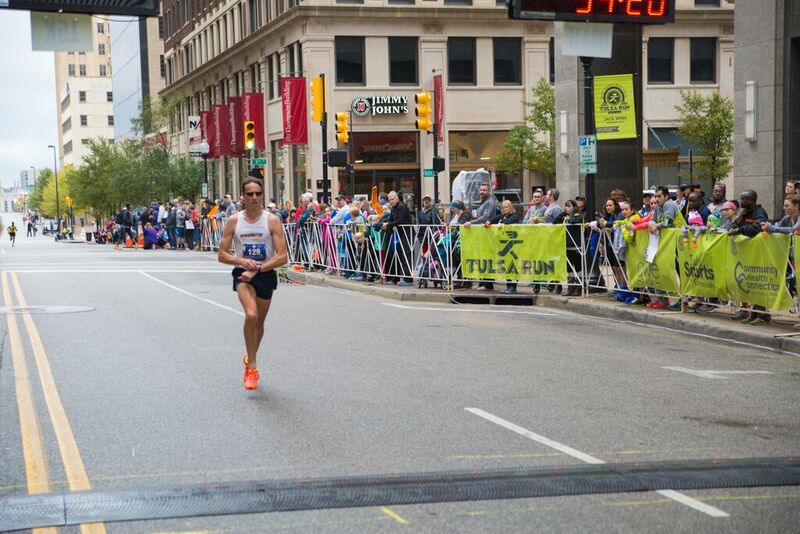 Butler, who finished 4th overall, hit the 5K mark in 16:52, 47 seconds ahead of ATC's 1st runner, Victor Breedveld (Atlanta GA). But ATC's 2nd and 3rd runners, Brad Slavens (Atlanta GA)and Matthew Whitis, were past the 5K before OK's 2nd and 3rd runners, Joseph Mitro (Mustang OK), and Jason Hatfield (Piedmont OK). . At that point ATC was a little over a minute ahead. Things had not changed much overall by the 10K split. Admittedly Butler now had nearly a minute and a half over Breedveld but Slavens had nearly 2 minutes on Mitro with Whitis leading Hatfield by 24 seconds. But Butler was too strong over the last 5K, stretching his leading time from a minute and a half to over 3 minutes and it was just too much. All of the other runners hung tough and had great performances but Butler made the difference as OK prevailed over ATC in the end by a mere 30 seconds. What a great contest! 1-Cal Coast Track Club 2:35:43, 2-OK Runners Elite 2:50:26, 3- Atlanta Track Club 2:50:56. 50+: The Playmakers Elite/New Balance team (Lansing MI) took this contest unopposed in 2:50:11. But Playmakers came ready for anything. And with their usual tight finish it is unlikely any other team could have headed them. 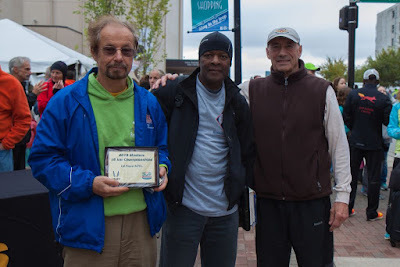 Ron Zywicki (Traverse City MI) and Dave Bussard came in together in 56:34 and Ruben Henderson (Grand Rapids MI) was only 30 seconds back. 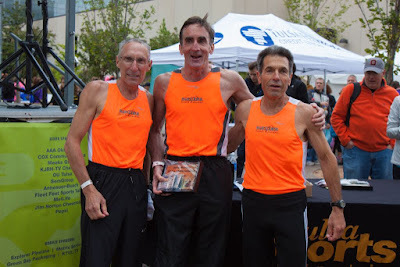 60+: The Boulder Road Runners had the stronger team today. John Victoria led the way but Devin Croft (Littleton CO) and Bruce Kirschner (Louisville CO) stayed ahead of their counterparts on the 2nd place team,the Genesee Valley Harriers (NY). 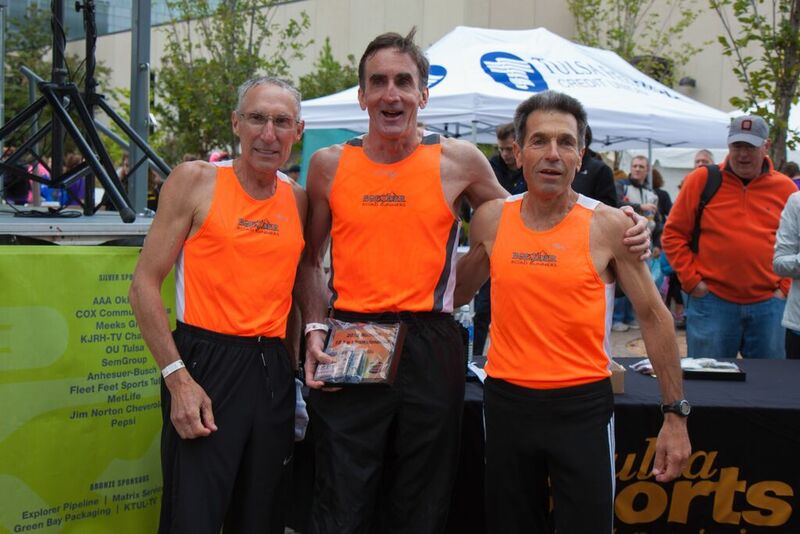 Mark Rybinski, Tim McMullen, and Bill Beyerbach ran strong races but Boulder had what it took today. Croft and Kirschner did a great job of sticking together during the race Croft hit 5K in 20:55 with Kirshcner on his shoulder. Kirschner struggled a bit over the 2nd 5k but still kept within 3 seconds of Croft. In the end only 5 seconds separated them. That gave Boulder a 5 minute gap over GVH at the end. Even though they did not get the win, GVH captured valuable points toward the Club Grand Prix championship. 1-Boulder Road Runners 3:07:06, 2-Genesee Valley Harriers 3:12:25 . 70+: The Shore Athletic Club and the Ann Arbor Track Club have had many memorable battles in this age division but not today. 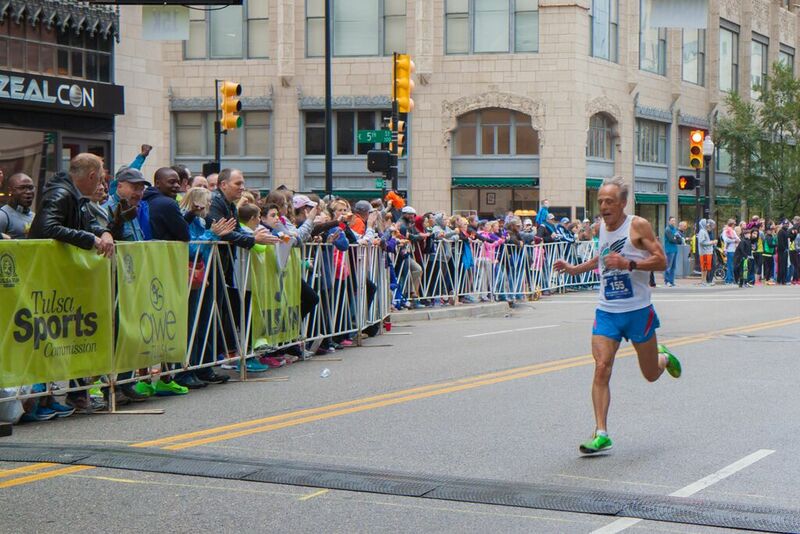 The two top runners for Ann Arbor, Doug Goodhue and Monte Piliawsky were nicked up and did not come to Tulsa. 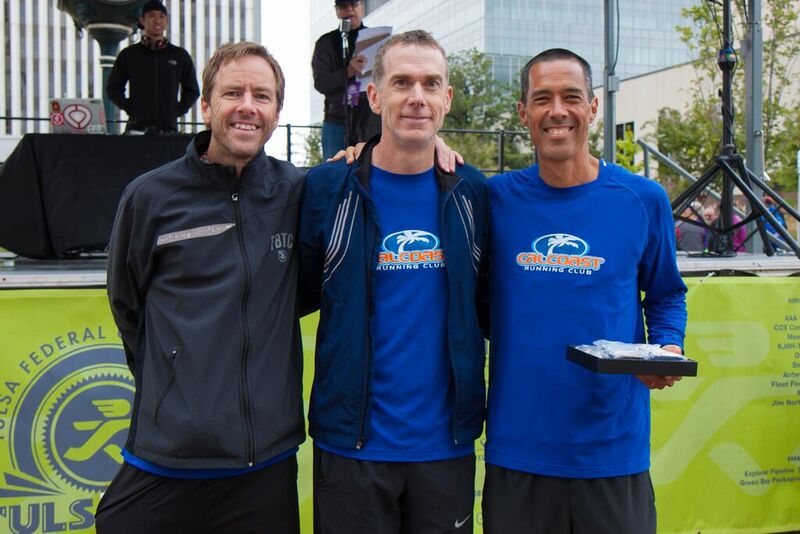 So Shore AC went home with a dominating win and the Ann Arbor TC [David Cohen, Phillip Kroll, and Malcolm Cohen (all of Ann Arbor MI)], was happy to go home with 2nd place points towards the Club Grand Prix. Przemyslaw Nowicki led the way for Shore AC but J.L. Seymore (Somerset NJ) and Roland Cormier were also finishing well ahead of their Ann Arbor counterparts. 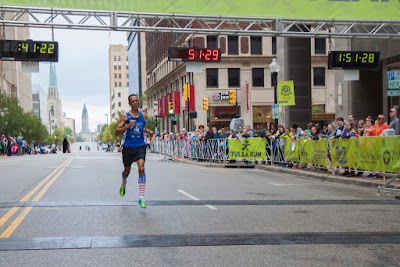 1-Shore AC 3:53:16, 2-Ann Arbor TC 4:24:44. 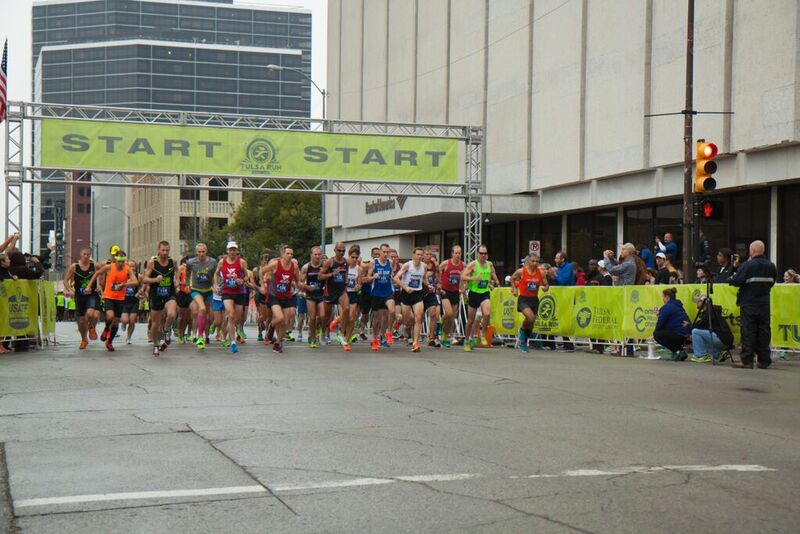 The Run expects to return to its historic flat, fast course in 2017 after Tulsa’s major riverside redevelopment is finished. If you are a Masters runner who relishes a challenge, be sure to run Tulsa in 2016!